Since I started working in Manchester city centre a few months back I have to say I’ve been slightly shocked by just how many people I’ve seen sleeping rough. It’s not just in Manchester either. When I’ve visited other cities in recent months there seems to be a notable increase in sleeping bags/cardboard boxes in doorways, folks begging for money and so on. I buy the Big Issue, I give change if I’m asked. I’ll also try and have a quick chat with homeless folks when I can as it sometimes seems like that’s more valuable to them than chucking a bit of change in a cup. Then whilst going through my Twitter feed the other day I noticed a retweet asking for volunteers for something called Street Support. 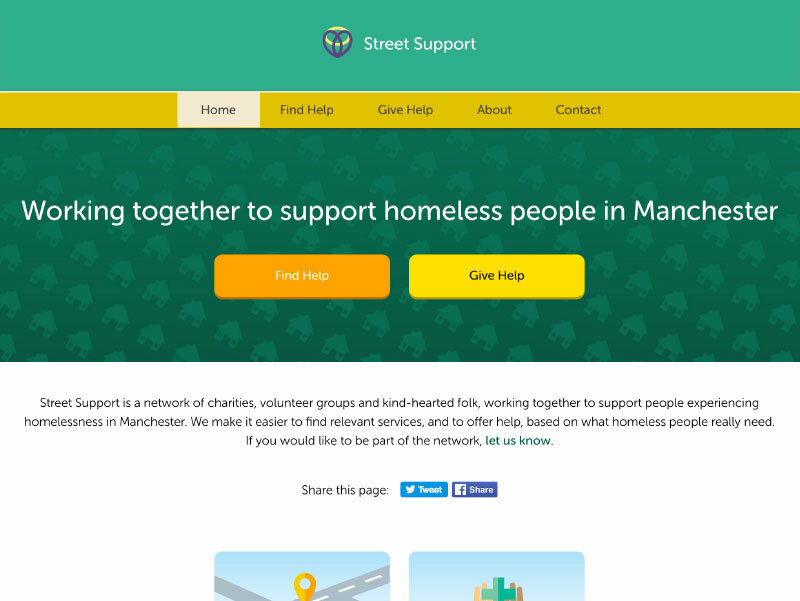 In their own words, Street Support is a network of charities, volunteer groups and kind-hearted folk, working together to support people experiencing homelessness in Manchester. It’s run by a collective of digital experts, working closely with homelessness organisations in the city. For the foreseeable future I’ll be trying to give a few hours a week to help out on the UI side of things – not easy with a full-time job and family life but I’ll do my best!